Intro: Could lighting giants’ business spin-offs marking the end of vertical integration in the industry? 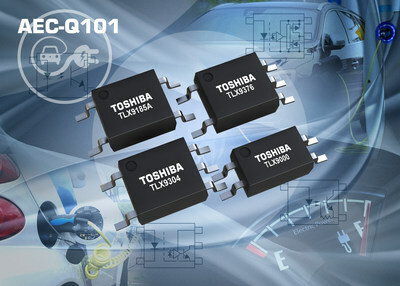 Toshiba America Electronic Components, Inc. (TAEC)* has introduced a new range of 10 AEC Q101-qualified photocouplers designed to address the demanding isolation, interface, switching, and form factor requirements of automotive applications. Toshiba's new range of photocouplers features a wide variety of devices – including the IC output TLX9304, TLX9378 and TLX9376 – which are housed in low-profile SO6 packages and offer data rates of 1Mbps, 10Mbps and 20Mbps, respectively. Also supplied in SO6 packaging are the TLX9300 and TLX9185A transistor output and TLX9905 and TLX9906 photovoltaic output devices. The TLX9000 and TLX9291A offer transistor outputs as well, and are differentiated by their half-pitch SO4 packages. An SO6-packaged photorelay – the TLX9175J – is also available. Toshiba's new photocouplers offer solutions that can operate at temperatures from -40ºC to 125ºC (except TLX9175J: Topr-55ºC to 105ºC), making them suited to inverter control and intelligent power module (IPM) interface applications in conventional, electric vehicle (EV) and hybrid electric vehicle (HEV) applications. The photorelay is designed to meet automotive battery control needs. Despite their small size, all of the new photocouplers have creepage/clearance distances of 5mm and offer a minimum isolation voltage of 3750Vrms. The TLX9304, TLX9378 and TLX9376 integrate a GaAlAs infrared light emitting diode and high-gain, high-speed photodetectors. An internal Faraday shield provides a common-mode transient immunity of 15kV/μs. In the case of the TLX9175J photorelay, the LED technology is based on a gallium arsenide construction. A high-voltage MOSFET between the relay's output terminals meets the needs of battery control systems. If you need more information ,please visit our website:www.powerwaywafer.com，send us email at angle.ye@powerwaywafer.com or powerwaymaterial@gmail.com.